Marilyn Hoffman has been an established artist and art instructor in Quincy since 1989. Her drawings, oils and acrylics have been widely exhibited both in Plumas County and in the Southern Bay Area communities of Saratoga, Los Gatos and San Jose. She has established several galleries and teaching centers in Quincy through the years and continues to offer private lessons. Now, as a member of Main Street Artists Gallery, she will be showing a collection of her recent works during the month of June. One of the few artists who is comfortable working in both realistic and abstract styles, Marilyn's focus lately has been on experimentation with abstract forms in oil, acrylic, pastels and watercolor. She has perfected the ability to convey mood (which she characterizes as both hot and cold) through the use of color. 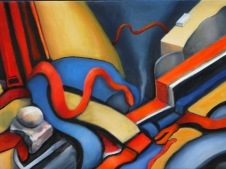 The June show will have works distinguishing these moods on each of the gallery walls: cool on one, hot on the other. Her use of iridescent acrylic paint provides a shimmering glow to many of the works, giving them an ethereal quality. She sees the interaction between colors as a puzzle not unlike the logic puzzles she does for fun. She works colors and forms, changing them as the painting "speaks to her" and she reaches a "happy balance." Marilyn will often start a piece in acrylic and finish it off in oil for ease of blending and to achieve a special vibrant quality. Twenty years ago, Marilyn began painting miniatures on small canvases, some only 2 x 3 inches. They depict animals, flowers, fall scenes, still life arrangements and have been very popular as well as affordable for beginning collectors. Among the mini-canvases featured in the June show will be a series of cats of various breeds, a proven popular theme. Although constantly expanding her repertoire, Marilyn is above all committed to passing on her skills to students both young and old. She provides excellent classes as well as promoting student work. In future paintings, she plans to strike out with bolder, more experimental pieces in larger format and with a more limited color spectrum to see where the exploration of mood will lead her. Marilyn's show opening will be Friday, June 7 from 5-7 PM. Complimentary wine and appetizers will be served.